I have been on hiatus for the last two BBB breads but now I am back with a new bread and a "refurbished" blog too. I've had some troubles with my selfhosted wordpress blogs causing troubles to my admin people and their servers so I decided that it was time for a change since this was bothering me too much and I didn't want to deal with this kind of troubles every now and then not even knowing what exactly was causing the troubles. So I have to shout out a huge thank you to Silvio and Bea of BlueLionWebdesign for alawys being there for me and for their outstanding customer support. Bea and Silvio have been a constant support through all my adventures since 2006. Once again it is me who needs to say thank you for always being only an email or Facebook message away. You rock! Thus said: Silvio transfered all my old blog posts form both the cats' blog and my foodblog into one blog and I still need to edit all the old transfered entries to tag and categorize them in order for you to find them in the search and the navigation properly. But now to something completely different and he main reason for this post: Bread. She - who whines at us at any given chance for having he made to bake the Croc - mad us need by hand a dough that could easily be known as the little sister of all Crocs! Ha! Please find the original recipe in the link to Elizabeth's link above as I have made some changes to her instructions. As always I have used all spelt flour instead of wheat. I used fresh yeast as I did not have instant yeast on hand plus I used alternate topping as I found out too late that I did not have the required ingredients for the topping Elizabeth suggested. This dough I tell ya was a real beast. I had a hard time preventing it form sticking to my hands and fingers. 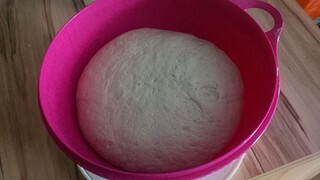 Some real slapping and cursing was needed before the dough behaved like it should. It rose like a charm tho once it was in his bowl and happily resting. I took the breads with me to friends where we enjoyed them with grilled a t-bone steak, some chicken, sweet potato sticks and corn on the cob. It was a perfect addition to this barbecue meal. Awesome! Mixing the dough Pour the water into a largish bowl. Whisk in the yeast. Add the flours, baking powder and salt and stir with a wooden spoon until the dough pulls away from the sides of the bowl. 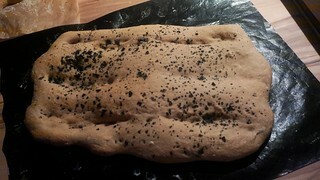 Kneading: Turn the dough out onto an UNfloured board. Wash and dry the mixing bowl. Please do not be tempted to skip this step. When the dough is smooth, place it in the clean mixing bowl (there is no need to oil the bowl). Cover the bowl with a plate and leave in a draft-free area to rise to double. Prepare the sauce: Whisk flour, baking soda and water in a small pot. Bring it to a boil. Remove from heat and set aside to cool. Final Shaping: Brush each round with the sauce. Really slather the sauce on. It will keep your hands from sticking to the dough. 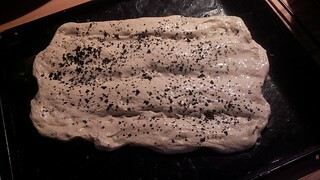 Liberally brush ovals with the sauce once more and sprinkle with nigella seeds. Allow the ovals to stand for about 30 min. Put the lengthened ovals onto the hot stone. 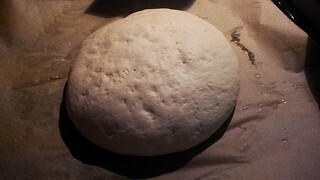 Move the stone over to cook the bread on indirect heat. Close the barbecue lid. 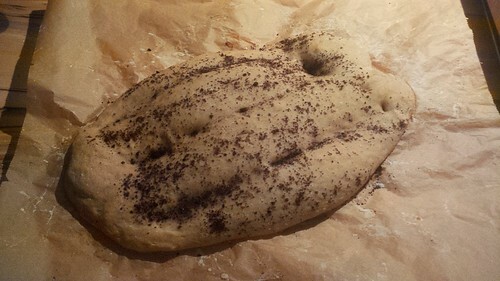 Every so often turn the bread around to account for uneven heat in the barbecue. Cook the bread until it is golden (about 15 minutes). 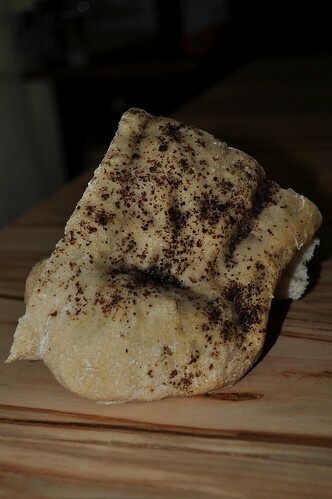 Note: If you do not have a barbecue, this bread can be baked in a conventional oven. Lida suggests baking it in a preheated 375F (190C) oven for about 30 minutes until golden brown. What's this Buddy thing all about? Every month one of us serves as the kitchen of the month, gathering all other Babes around her kitchen table and chooses the bread we will bake. Every 16th of a month we all post about the month's bread and the kitchen of the month invites everyone to join and bake the bread with us. If you decide so you will have until the 29th of every month to bake and post about it. Then simply tell the kitchen of the month that you did and send a link to your post. The kitchen of the month Babe will then do a roundup with all the Buddies that baked with us and you will even earn a nice Buddy Badge to show on your blog as a little Thank You for baking with us! Great new blog Astrid! 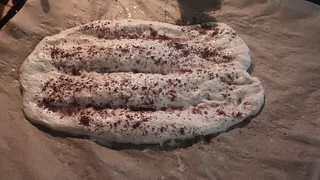 I like the description of this dough as little sister of the Croc...and yours look delicious! And we`ll throw it at Elizabeth whenever she dares to whine about the croc again, ha! Glad you`re back in business here. Were there pictures made? If so we want them!